We are on October's doorstep so for the next few weeks we'll be sharing some great fall treats and crafts! 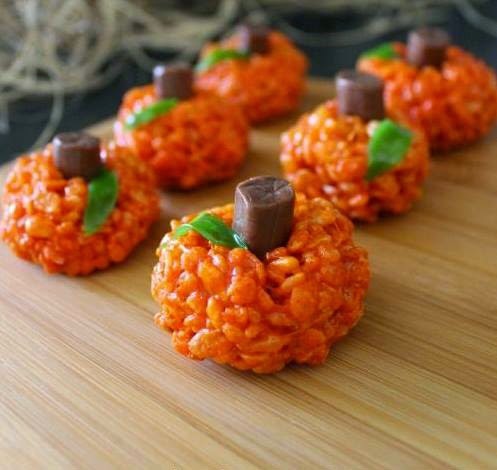 Starting with these super adorable Rice Krispie pumpkins! Perfect for a fall birthday party, a class treat or just a gooey treat for at home! To make, all you need to do is follow the Rice Krispies treats recipe on the back of the box. When your marshmallows are nice and melty add red and yellow food colouring until you reach a pumpkin orange colour. After you stir the cereal into the marshmallow mixture, rub some butter on the palms of your hands and roll the mixture quickly into balls. 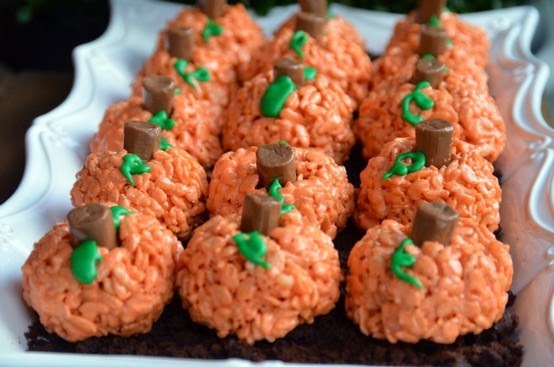 Place a Tootsie roll in the centre of each pumpkin and garnish with frosting leaves.